The Illusion quilt was started for our son John while he was in grades school. Our older son Tim, at the Chicago School of the Art Institute had brought home a book on Escher’s Illusion paintings and placed it in our home library. 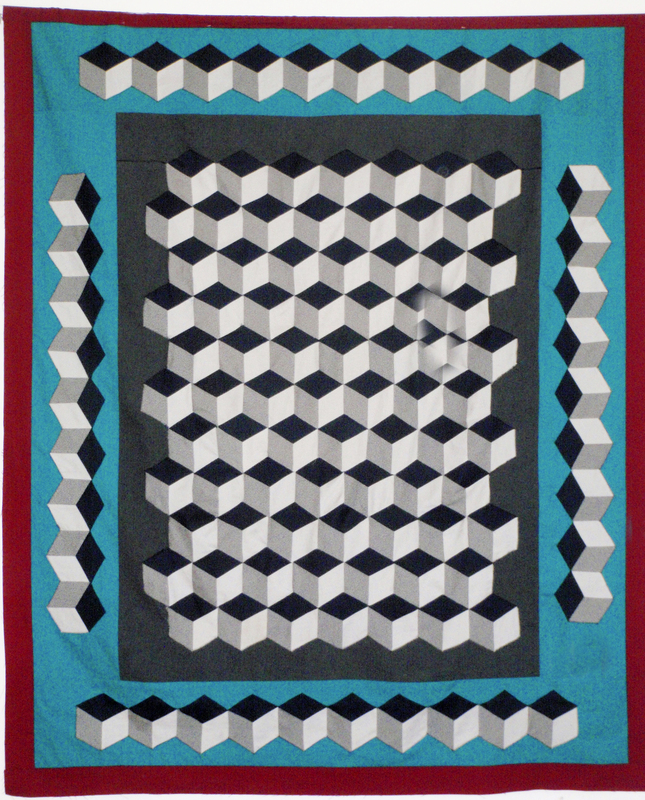 A dazzling but difficult pattern known as Tumbling Blocks was chosen for Johns quilt. Each block was made of three 60 degree diamond pieces Linda cut the diamond-shaped pieces out of gray, black and gray print then hand sewed them together to form a 3-sided block. The quilt was to be completed by John’s 8th grade graduation. That date came and went, then the high school years came and left as well. When John graduated from Columbia College the quilt was still unfinished. By now Linda had accumulated a stack of 120 blocks. We began to put the blocks together to form rows. All of this was done by hand using very small stitches. When John went away to college the quilt was put aside for a long time as Linda took a full time college teaching job. Both of us retired in 2003 and moved to our winter home in Florida. While in Florida I decided to learn how to sew on my mother’s old Singer Featherweight sewing machine but it was too small so I bought a new Jenome Sewing machine that had a long neck and was self-threading. As I was sorting through some of the fabric that we had in our sewing room I came across the stack of blocks for John’s Illusion Quilt. With a great ordeal of ripping and resewing, I began to understand what the quilt needed and finished the top and then took it to a professional long arm quilter and binder for finishing. We presented the quilt to our now married son at a restaurant, asking the waitress for help in holding it up to display it’s queen size.The restaurant customers in booths and at tables applauded and some gave us a standing ovation.